This is part 22 of a 31-part posting of my journal entries and photos from one of the greatest experiences of my life so far--a month-long mountain climbing trip to the Atacama Desert area of northern Chile and Argentina, which included summiting three 6000 meter peaks (~20,000 feet). To view all the entries in this series, check the posts labeled South America. 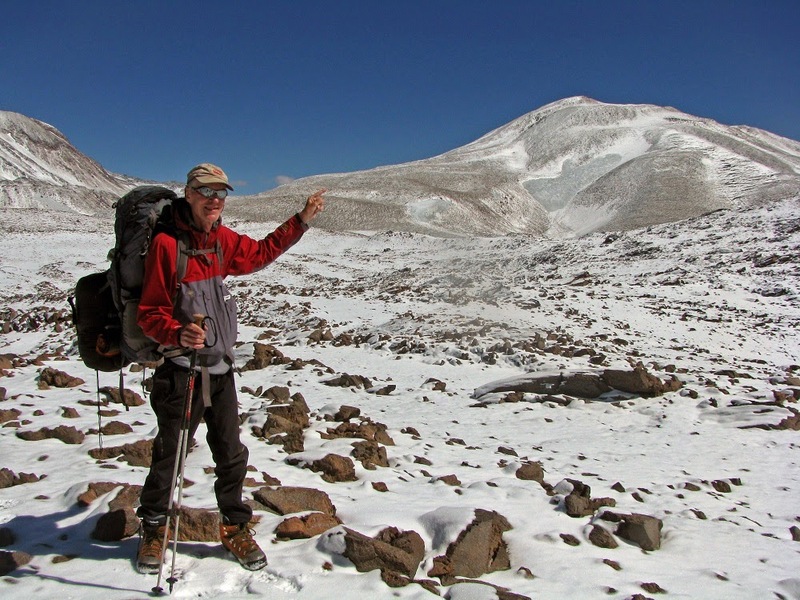 Hauling all my own stuff - about 70 pounds of it, I'm headed to the base of the mountain over my right shoulder--Ojos del Salado, second highest mountain in the western hemisphere. I didn’t sleep for a very long time. I attribute it to the caffeine in the GU I consumed during the Medusa summit effort. Maybe also it was just the excitement of having made my goal. It snowed briefly around 10PM, no more than a third of an inch, then cleared up the rest of the night. A nice moon was out until midnight. I finally noticed some dreams after 3AM or so - first substantial bits of sleep that I was aware of. The morning dawned clear and cold with temperature as low as 15 degrees at sunrise. We all announced our decisions for the day at breakfast, which didn’t commence until about 8:20AM. The sun hit our tent about 7:50. Brian, my tentmate was suffering from a continuing headache, even slightly worse than yesterday, so he opted to stay at camp. 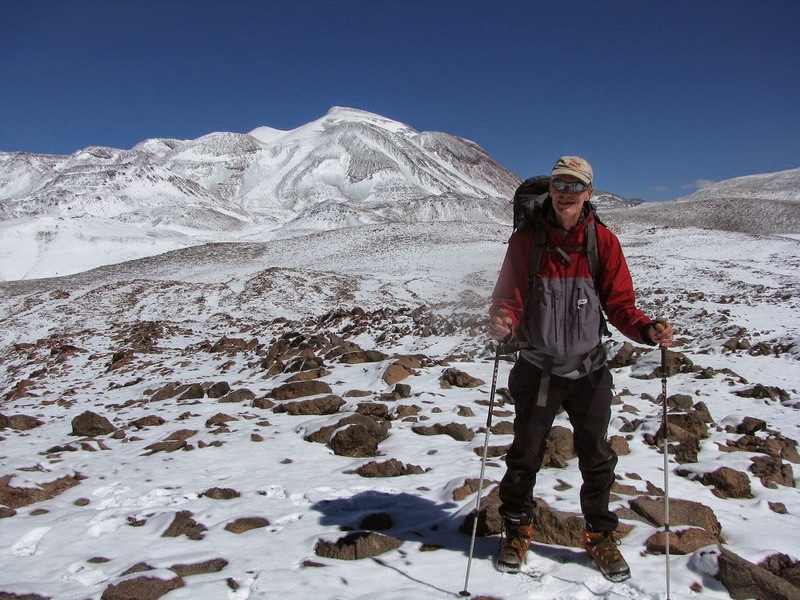 Barry and John (expedition leader) were staying and planning to try to climb Cazadero from there because Barry had already climbed Ojos and they felt they could summit Cazadero (~6600m) from base camp tomorrow and get all the way back. So it was just Thom, Phinella and me who packed up and headed to Ojos high camp, led by Damian as our guide, and carrying with us two tents, food, fuel, etc. Damian and Thom had been at our high camp for 20 or 25 minutes by the time I arrived; and they had already set up the two tents: one for Phinella and I and one for them. The camp is a beautiful setting, worth exploring on our rest day tomorrow. (Thom and Damian plan a summit attempt). Phinella and I settled into our tent and had some nice conversation while Damian cooked and served us tea and then soup, main course, and dessert in our tents. It had been snowing pretty hard all that time with light wind and a few claps of thunder around. It had already accumulated 2 inches or more by 7PM when Thom brought tea for Phinella. I caught up on my journal, finishing at 7:25PM and then just laying down in bed to rest and recover from the hard “piston” workout that my legs had with all that weight. Later when I warmed up I changed into my regular bed layers and went to bed formally. Phinella read with her lamp for a bit and then went to bed too.